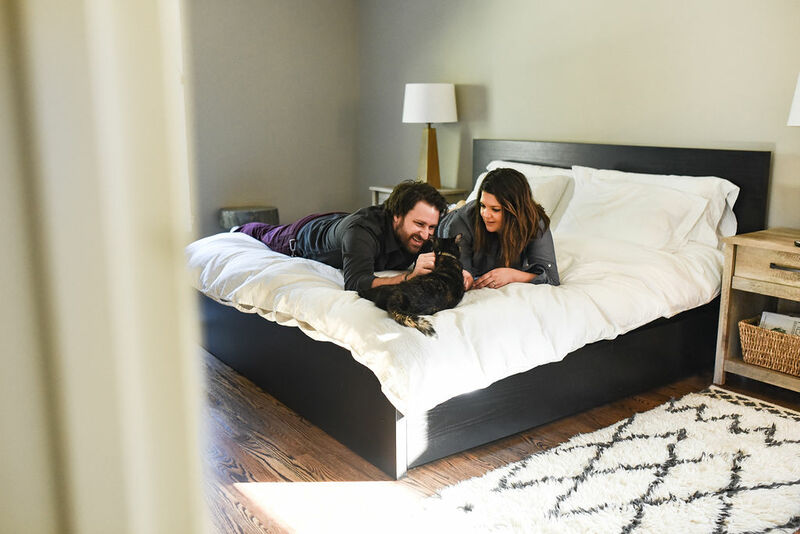 When Lauren and Grant Essig began looking for a larger home early in 2016, they turned to Colleen Reisenbichler, their John Jackson Neighborhood Real Estate agent, for help finding something that was move-in ready and didn’t require a lot of work. 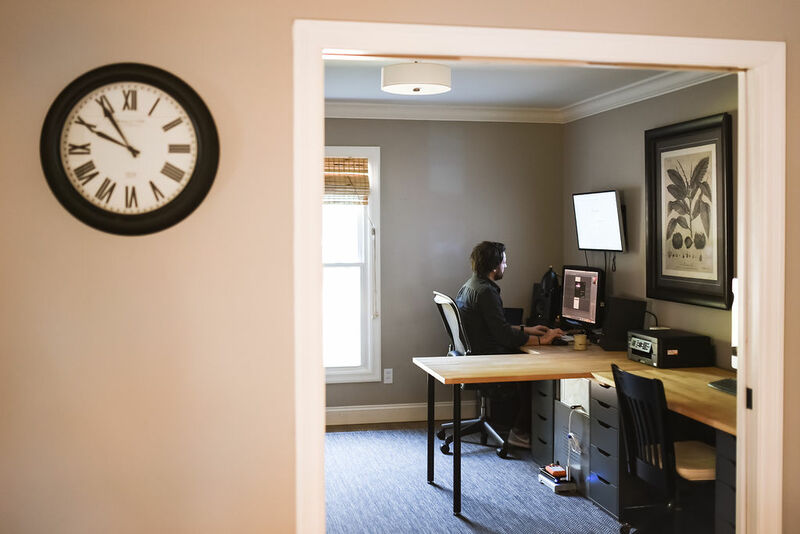 Lauren, assistant director of financial aid at Maryville University, and Grant, creative director at Brighton Agency, lead a busy life with their 5-year-old twins, Burke and Ainsley, and their oldest, 9-year-old Anderson. With so much going on in their daily lives, they wanted to spend weekends enjoying their next house instead of always working on one project or another. 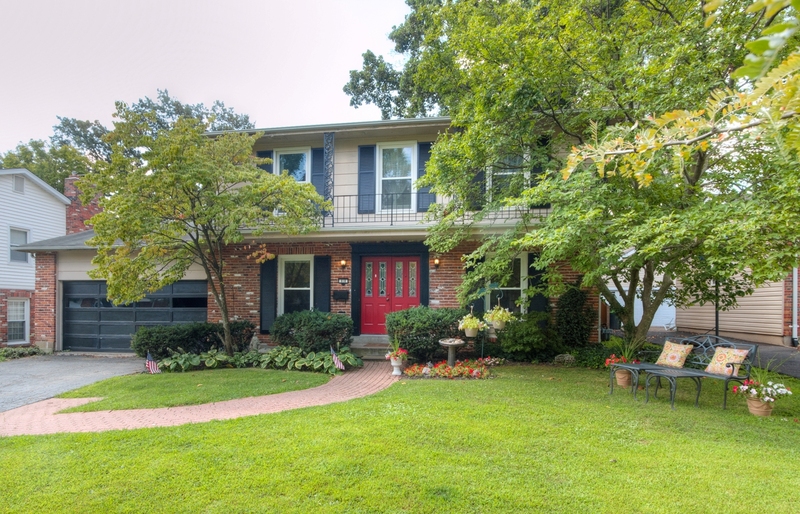 After an extensive search looking at dozens of properties, Colleen called Lauren with an idea — another JJNRE client was getting their family home in Glendale ready to go on the market. It was the perfect property in many ways. It was the right size, it had the number of bedrooms and bathrooms they needed, and it was in the heart of Glendale on a quiet cul-de-sac — something the Essigs never really thought would be a possibility. On top of all that, the price was well below their budget. The only problem: This 50-year-old home was due for some significant updates. But Colleen wasn’t convinced that was really a problem. 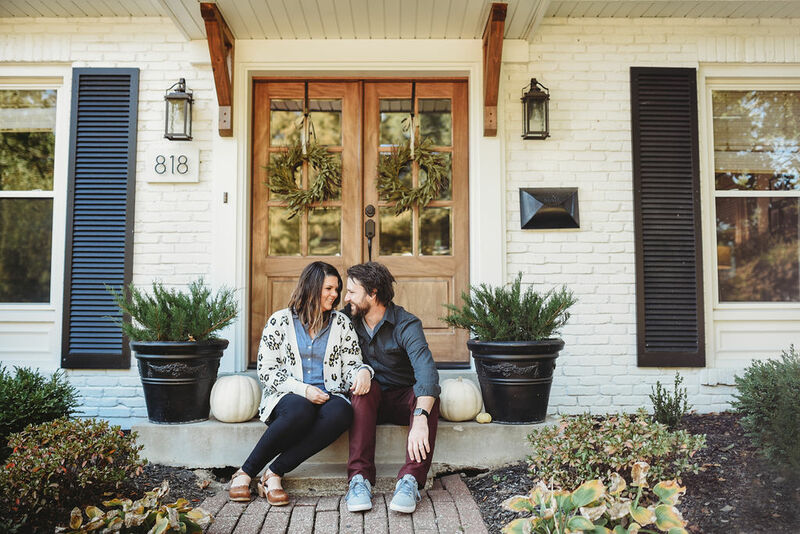 She had admired the couple's design skills at their first home, and she had a gut feeling that Lauren and Grant, if anyone, had the artistic vision and talent to transform an older house into the home they were looking for. And that is exactly what happened. The Essigs closed on 818 Hanamoor Court in October 2016. After knocking down walls, refinishing floors, gutting all of the bathrooms, replacing all the lighting, doors and trim, and painting virtually every wall, the house on Hanamoor is now a gorgeous reflection of the Essig’s style — a soothing fusion of modern and cozy. All within striking distance of their original budget. 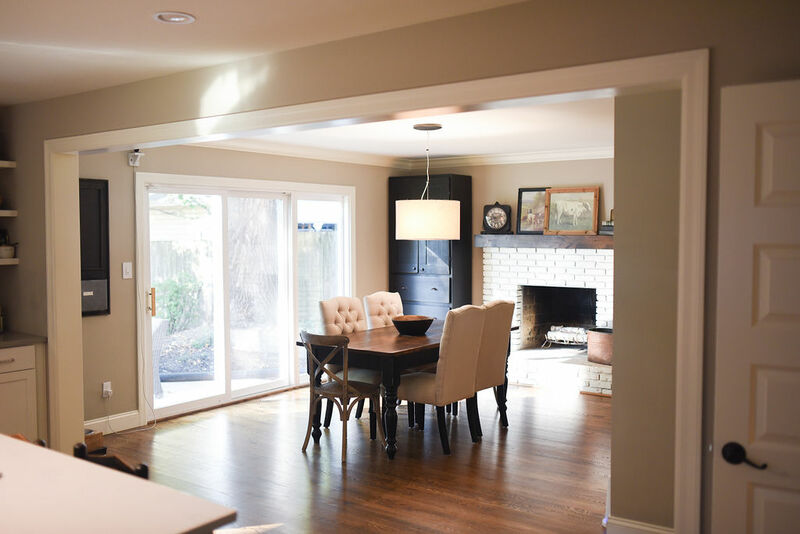 According to Colleen, this property wouldn’t have been a fit for many of the clients she works with because they either don’t see the potential in older homes or don’t have the time and energy to put into it. 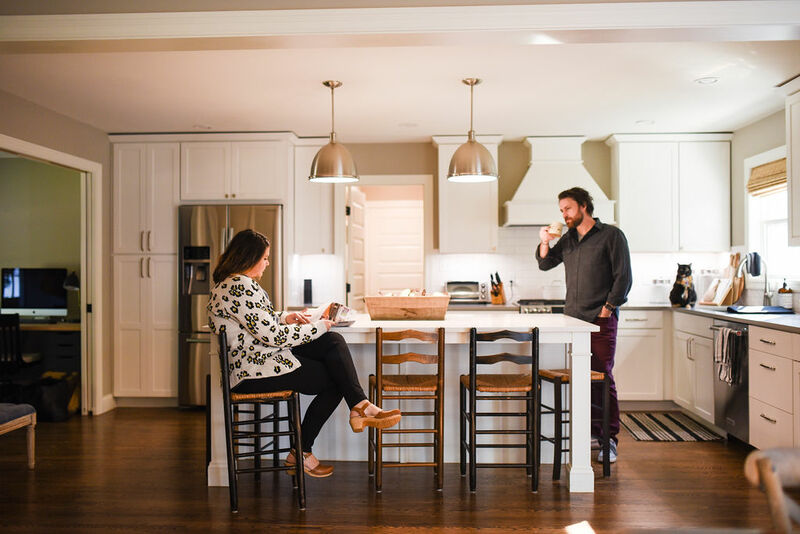 Lauren and Grant Essig transformed the house on Hanamoor Ct. with their own cozy, modern style. Outside, they replaced the siding, removed the second-floor railing and painted the brick exterior white. Lauren said, “A white house with black shutters is just classic — it never goes out of style.” Photo by: Jaclyn Jezik with One Twenty Two Photography and Design. BEFORE: 818 Hanamoor Ct., 2016. Photo By: Mark Schmitz with Wideiphoto. BEFORE: The kitchen at 818 Hanamoor Ct., 2016. Photo By: Mark Schmitz with Wideiphoto. AFTER: The kitchen at 818 Hanamoor Ct. today. 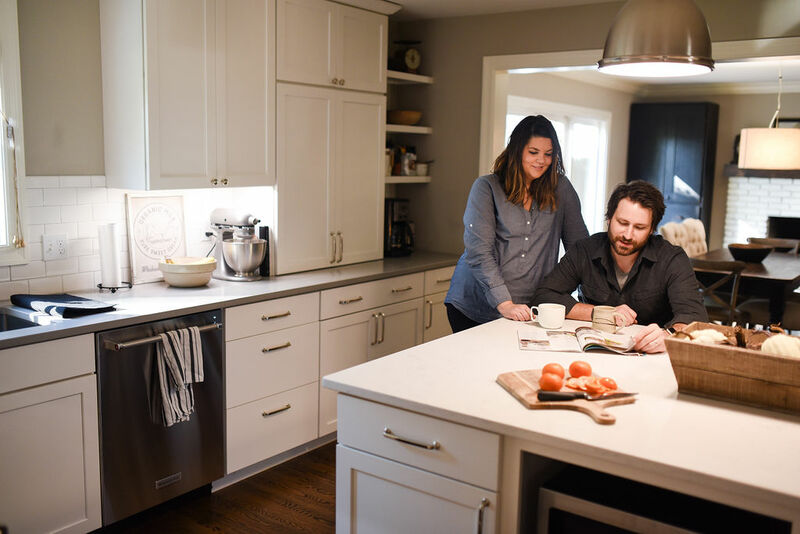 Lauren and Grant enjoy a cup of coffee in their new kitchen, which now features bright white cabinets, open shelving and a quartz-top island. Photo by: Jaclyn Jezik with One Twenty Two Photography and Design. AFTER: They knocked down a wall to open the kitchen up to the dining area and installed all new appliances and lighting. Photo by: Jaclyn Jezik with One Twenty Two Photography and Design. BEFORE: The family room at 818 Hanamoor Ct., 2016. Photo By: Mark Schmitz with Wideiphoto. AFTER: “The house felt very compartmentalized,” said Lauren, “so we tore down the wall between the kitchen and what was then the family room, painted the brick fireplace and mantel white and generally opened things up more.” Photo by: Jaclyn Jezik with One Twenty Two Photography and Design. BEFORE: Dining room at 818 Hanamoor Ct., 2016. Photo By: Mark Schmitz with Wideiphoto. AFTER: What used to be the dining room is now a warm, brightly lit family room. Photo by: Jaclyn Jezik with One Twenty Two Photography and Design. AFTER: Just off the kitchen, the Essigs created a home office for Grant, who is a creative director for a local marketing agency. Photo by: Jaclyn Jezik with One Twenty Two Photography and Design. AFTER: The master bedroom has an open, spa-like feel. “Being able to put our own touch on this home was so important,” Lauren said. Photo by: Jaclyn Jezik with One Twenty Two Photography and Design. 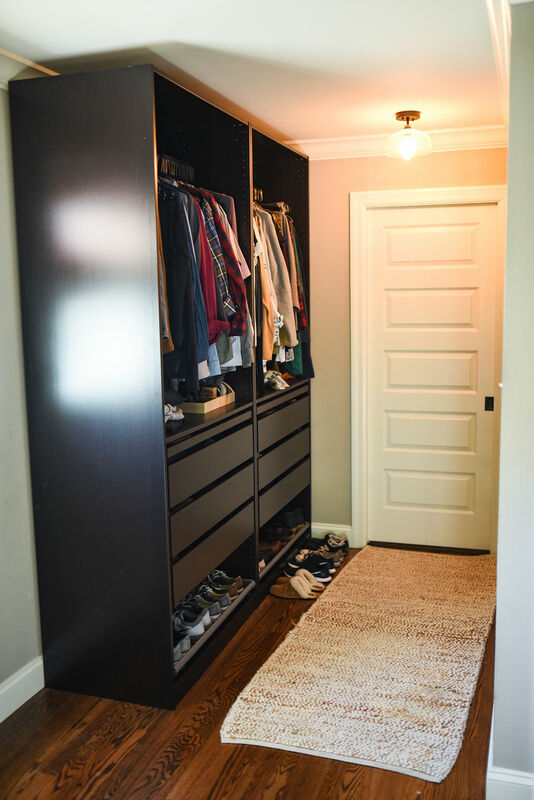 AFTER: There wasn’t room for a large master closet, so Lauren and Grant designed open shelving between the bedroom and bathroom. Photo by: Jaclyn Jezik with One Twenty Two Photography and Design. BEFORE: The hall bathroom 818 Hanamoor Ct., 2016. Photo By: Mark Schmitz with Wideiphoto. 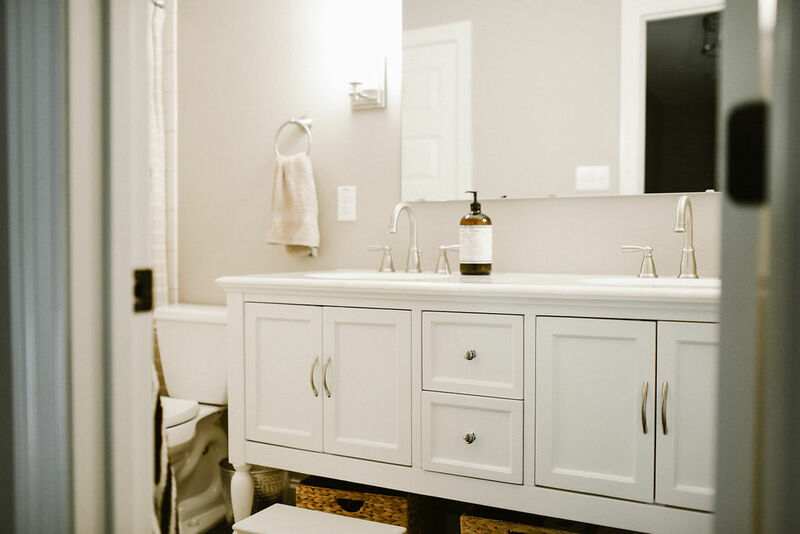 AFTER: The hall bathroom is bright and chic after removing outdated tile and replacing the woodwork, lighting, hardware and vanity. Photo by: Jaclyn Jezik with One Twenty Two Photography and Design. 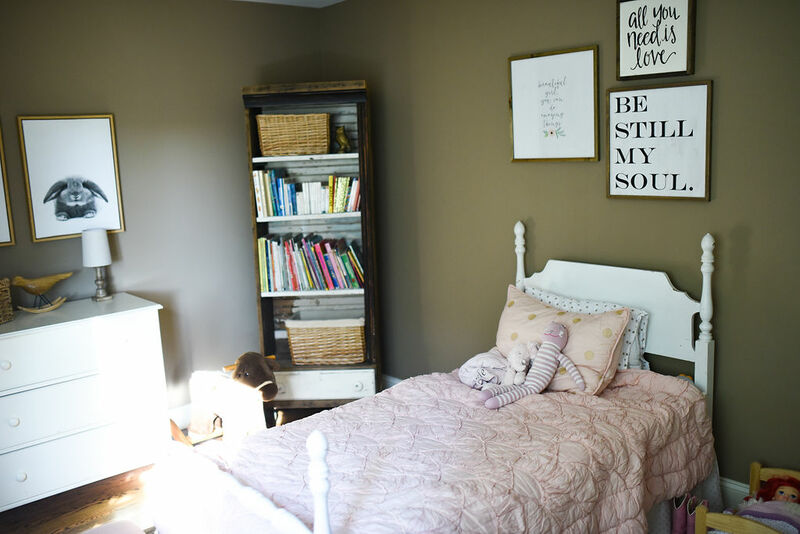 Ainsley’s room: “We love that Glendale is a small, safe town with quiet streets where our kids can play outside and walk to school,” said Grant. “It reminds us of our own hometowns.” Photo by: Jaclyn Jezik with One Twenty Two Photography and Design.